18-MC is in the early stages of human testing by Savant HWP. In 2002 the research team started trying to raise funds for human trials, but were unable to secure the estimated $5 million needed. In January 2010, Obiter Research, a chemical manufacturer in Champaign, Illinois, signed a patent license with Albany Medical College and the University of Vermont allowing them the right to synthesize and market 18-MC and other congeners. National Institute on Drug Abuse gave a $6.5 million grant in 2012 to California based drug developer company Savant HWP for the human trials. ^ S.D. Glick; Kuehne, ME; Maisonneuve, IM; Bandarage, UK; Molinari, HH (1996). "18-Methoxycoronaridine, a non-toxic iboga alkaloid congener: effects on morphine and cocaine self-administration and on mesolimbic dopamine release in rats". Brain Res. 719 (1–2): 29–35. ^ Glick, Stanley D.; Sell, Elizabeth M.; Maisonneuve, Isabelle M. (2008). "Brain regions mediating α3β4 nicotinic antagonist effects of 18-MC on methamphetamine and sucrose self-administration". European Journal of Pharmacology 599 (1–3): 91–5. ^ I.M. Maisonneuve; Glick, SD (2003). "Anti-addictive actions of an iboga alkaloid congener: a novel mechanism for a novel treatment". Pharmacol. Biochem. Behav. 75 (3): 607–18. ^ Glick, SD; Ramirez, RL; Livi, JM; Maisonneuve, IM (2006). "18-Methoxycoronaridine acts in the medial habenula and/or interpeduncular nucleus to decrease morphine self-administration in rats". European Journal of Pharmacology 537 (1–3): 94–8. ^ Taraschenko, OD; Shulan, JM; Maisonneuve, IM; Glick, SD (2007). "18-MC acts in the medial habenula and interpeduncular nucleus to attenuate dopamine sensitization to morphine in the nucleus accumbens". Synapse 61 (7): 547–60. ^ Taraschenko, OD; Rubbinaccio, HY; Shulan, JM; Glick, SD; Maisonneuve, IM (2007). "Morphine-induced changes in acetylcholine release in the interpeduncular nucleus and relationship to changes in motor behavior in rats". Neuropharmacology 53 (1): 18–26. ^ Glick, SD; Sell, EM; Maisonneuve, IM (2008). "Brain regions mediating α3β4 nicotinic antagonist effects of 18-MC on methamphetamine and sucrose self-administration". European Journal of Pharmacology 599 (1–3): 91–5. ^ Taraschenko, OD; Rubbinaccio, HY; Maisonneuve, IM; Glick, SD (2008). "18-methoxycoronaridine: a potential new treatment for obesity in rats?". Psychopharmacology 201 (3): 339–50. ^ Kuehne, ME; He, L; Jokiel, PA; Pace, CJ; Fleck, MW; Maisonneuve, IM; Glick, SD; Bidlack, JM (2003). 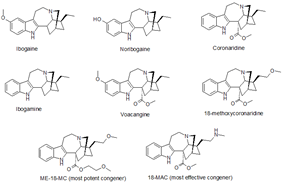 "Synthesis and biological evaluation of 18-methoxycoronaridine congeners. Potential antiaddiction agents". Journal of Medical Chemistry 46 (13): 2716–30. ^ Pace, CJ; Glick, SD; Maisonneuve, IM; He, LW; Jokiel, PA; Kuehne, ME; Fleck, MW (2004). "Novel iboga alkaloid congeners block nicotinic receptors and reduce drug self-administration". European Journal of Pharmacology 492 (2–3): 159–67. S.D. Glick; Ramirez, RL; Livi, JM; Maisonneuve, IM (2006). "18-Methoxycoronaridine acts in the medial habenula and/or interpeduncular nucleus to decrease morphine self-administration in rats". Eur. J. Pharmacol. 537 (1–3): 94–8.